Growing up outside San Diego in 1986, Hayter was not entirely at home in a world in which the norm was hyper-thin, tan, and blonde. At school, the kids taunted her, threw things at her. But when Hayter was eight a teacher took note of her natural vibrato, the recognition leading Hayter to become a soloist and church cantor. She sang weekly at her local church, beginning classical voice training in the sixth grade, around the time she became obsessed with Kurt Cobain. In high school, she got into grindcore, prog, math-rock, jazz, and noise, picking up influences from the likes of Ornette Coleman, Aaron Dilloway, and John Zorn as well as from San Diego bands the Locust and Cattle Decapitation. She went to shows and played in metal bands with her friends. At the same time, she was training for the conservatory and performing in small opera productions. It was during her time at the School of the Art Institute of Chicago, where she earned her BFA on a painting scholarship, that Hayter, under the mentorship of Mark Booth, began commingling language, sound, and image. Her undergraduate thesis involved a deconstruction of Bach’s Well-Tempered Clavier into a series of procedural poems, which were then turned back into music and accompanied by visual material. She continued the interdisciplinary approach at Brown, where she earned the MFA, in literary arts, in 2016 — and where, after ending an abusive five-year relationship, she started writing about violence against women. Her thesis work there, titled BURN EVERYTHING TRUST NO ONE KILL YOURSELF, included a thirteen-song cycle based on a 10,000-page manuscript composed largely of found material: misogynist lyrics, internet invective, and the like. 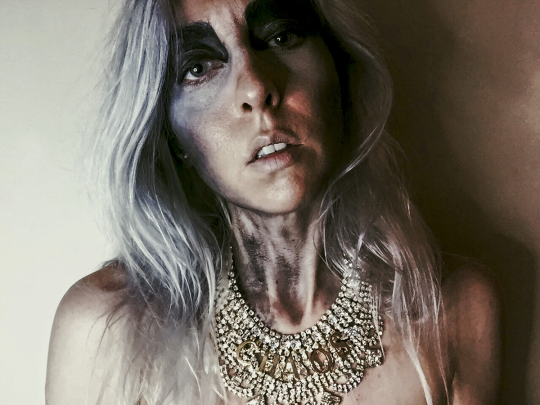 Her work brings to mind Tolstoy’s concept of the infectiousness of art — that is, one can’t rightly go on with one’s day after listening to or watching Lingua Ignota perform. Artfully, expertly, Hayter forces us to confront a violence to which we’ve become otherwise inured; in so doing, she creates a visibility for those who have been encouraged to remain silent, who have been dismissed.